For this expat, back home, any pleasures derived from autumn leaves meant scuffing through piles of the rotting and sodden things, scooped up like banks of snow on the sides of the road, on the way to school. Here in Japan though, as has been well documented by now, people like to watch them when still attached to the branches of trees, a practice attached to the term ‘koyo’ (紅葉) which refers to the changing of the autumn colors. While even Japan’s huge stockpiles of patience and a penchant for finding pleasure in minimalism and simplicity (see the pastime of ‘moss viewing’) stops short of people here watching autumn leaves change color in real time (at least not consciously), they do like to get out and look at them, preferably when at their peak. And well they might. Whatever the canvas, Japan’s autumn leaves paint their brooding reds, yellows and browns onto the landscape to quite breathtaking effect, rivaled (or bested) only by that other feverish nature watching season, hanami, as perhaps the most visually pleasing time of year to be in-country. A significant north-to-south spread means that it’s possible to view Japan’s autumn leaves over a period of up to three months, starting late September / early October in Hokkaido and higher elevations in northern and central Honshu, through mid November in western Japan, to late November and early December for urban areas around Tokyo, Osaka and Kyoto. And like its spring counterpart hanami, there are a number of scenarios in which the autumn-leaf experience can be, well, experienced. As with hanami, Japan’s koyo experience can by enjoyed even after nature has switched off her lights, by us lot switching on ours in, under, and around the prime foliage (at least those spots that aren’t too far off the grid). Unlike hanami though, night time viewing autumn leaves doesn’t have a snazzy name like ‘yozakura’ - 夜桜 - night cherry blossom). Instead it tends to be attached to the functional term ‘light up’ -- autumn leaf light up / 紅葉ライトアップ. Now here is a chance to witness some of Japan’s staggering levels of patience in action -- very slow action. A good example of which can be found at Rikugien (六義園 - pictured below), the turn of the 17th - 18th garden in Tokyo’s Bunkyo ward considered one of the most beautiful in the Japan capital. From mid-November to mid-December, the garden is host to one of the most celebrated autumn-leaf light ups in all of Japan, and about half an hour or more before nature goes into energy-saving mode an army of camera and tripod-toting enthusiasts stands dead still along the banks of Rikugien’s pond, shutters ready to capture the changing hues of this autumn-leaf-light-up money shot. Personally, my jittery form doesn’t have the patience to join them (nor do I have the camera kit to capture the moment in such tricky lighting) but the illuminated leaves, along with the brisk autumn evening temperatures, lend themselves more to a stroll anyway -- a pleasant one with friends, a romantic one with a date. Supping on a coffee or some hot sake completes the picture for what is potentially a truly beautiful, at times haunting, experience. 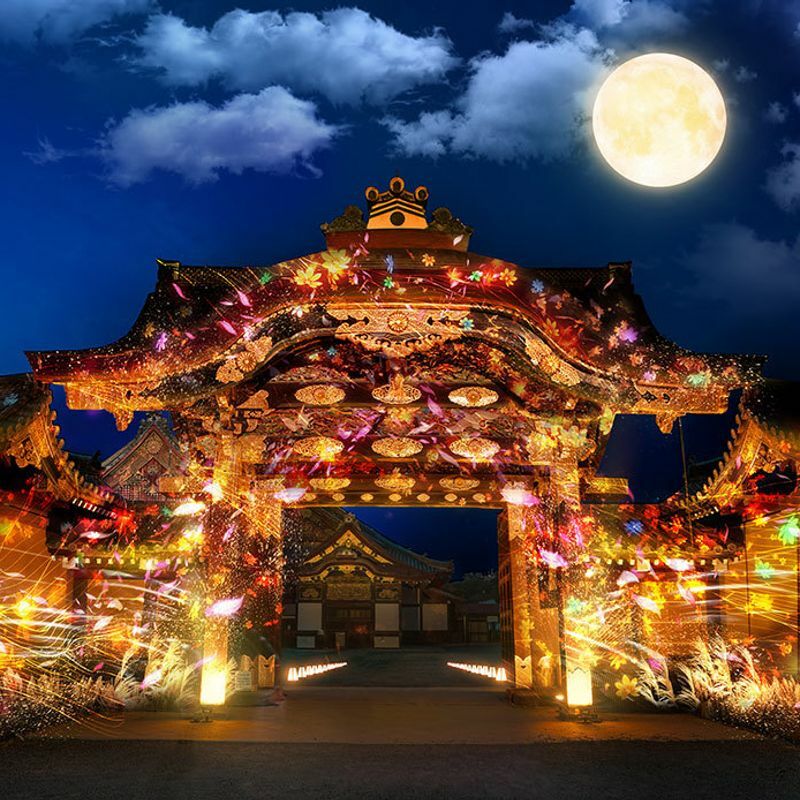 The Rikugien light up in 2019 runs from Nov. 18 - Dec. 10 with lights switched on between 17:30 - 21:00. 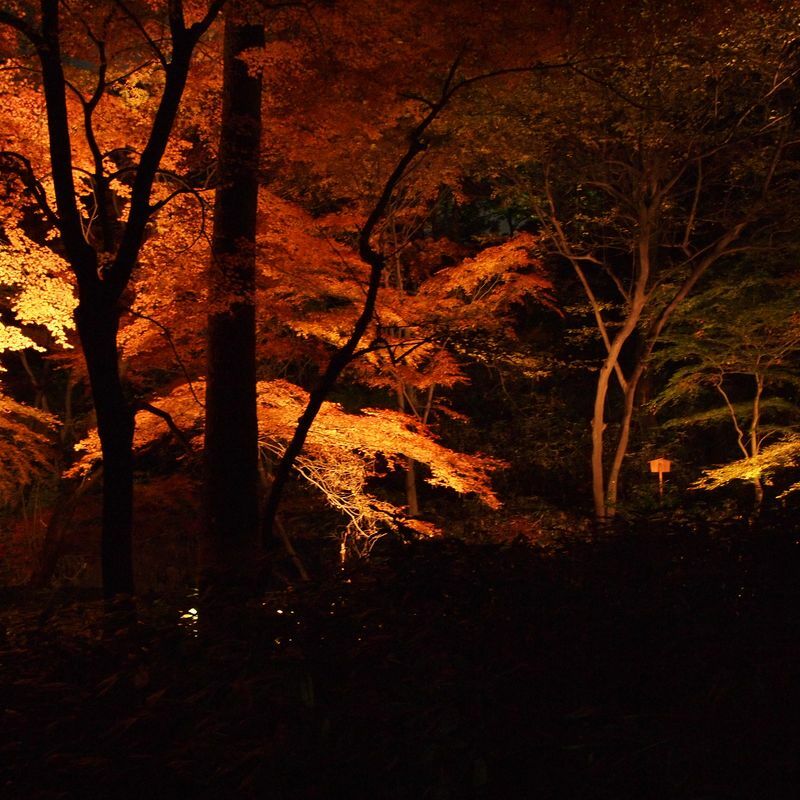 *Got a favorite autumn-leaf light up spot in Japan? 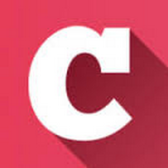 Share it with the community in the comments. What’s better, the ornate contours of a temple roof framed by cherry blossom, or the same scene ablaze with autumn leaves? We’ll put our entrance fee (where it might be required) on the cherry blossom edging that one. Either way though, the chance to see one of Japan’s marquee temples or shrines dressed in the fall collection is a prized one, so autumn-leaf viewers can expect to have to deal with intense crowds at such locations. Probably nowhere more so than in Kyoto, where Japan’s ancient capital and World Heritage hoarder, already groaning under the strain of a nation’s worth of tourists, boasts plenty of stellar locations for viewing autumn leaves with a side serving of ancient structure, or the other way round. In fact, Kyoto’s temples and shrines are regulars at the higher altitudes of lists detailing the best koyo spots in Japan. And some of them ‘light up,’ too. The experience is a beautiful one though, impossibly Japanese, and emphatically worth it if you’ve got the stomach for crowds. Still, Kyoto, and the rest of Japan for that matter, has plenty such structures to go around, meaning those harboring fewer concerns about name value should find the pickings rich in this form of autumn-leaf viewing. Let’s be brutally honest, parks, while tremendous resources for those of us living the life urban, have always been something of a plan B -- a make-do option when we haven’t time, money, or actionable motivation to be where it is we’d rather be -- in the mountains, lounging on a beach, soiling ourselves on a jet coaster -- unless maybe there’s booze and good company involved or we need to walk the dog / let the kids loose off some energy. And the same goes for viewing autumn leaves. In almost all cases, where Japan’s autumn leaves enjoy their finest hour isn’t in the nation's parks, unless that swathe of grass is actually the grounds of a castle that’s been forced to adopt the brute practicality of a park. But they can still put on a show. 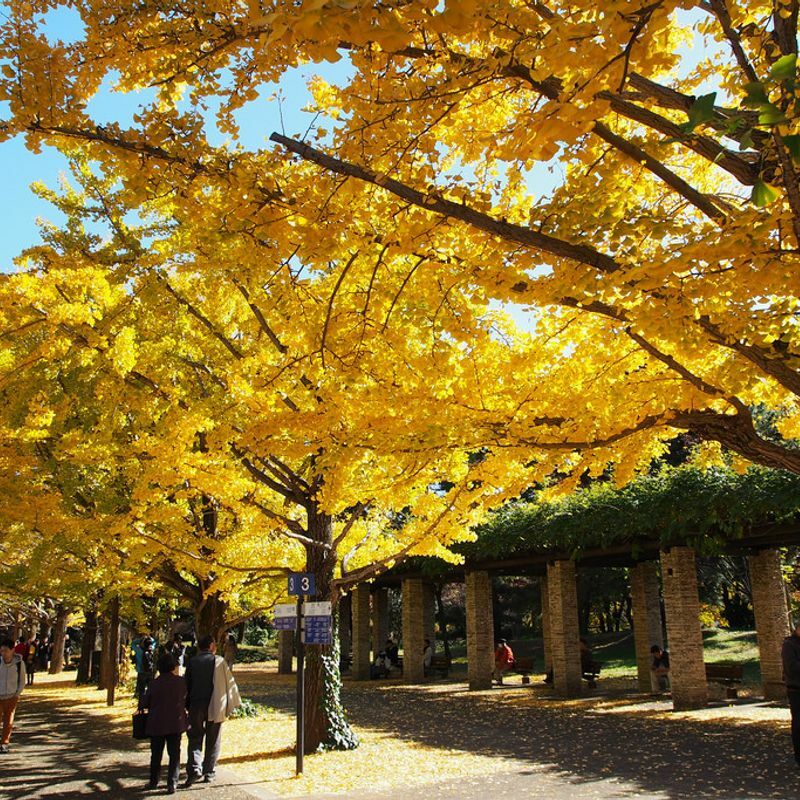 Perhaps the most showy of them all in autumn is the gargantuan Showa Kinen Park, western Tokyo, famous for its gingko trees the leaves of which turn a golden yellow during fall. In fact, where parks might be said to excel as place to view autumn leaves, is in the sense of order that they bring to proceedings. It’s here that casual viewers can perhaps gain easiest access to ‘avenues’ of trees -- where trees are lined up nicely either side of a thoroughfare to the point where branches may even reach out and intertwine in the middle, creating a kind of tunnel effect. While more prized during the cherry blossom season, these avenues and tunnels can be visually striking during fall as well. 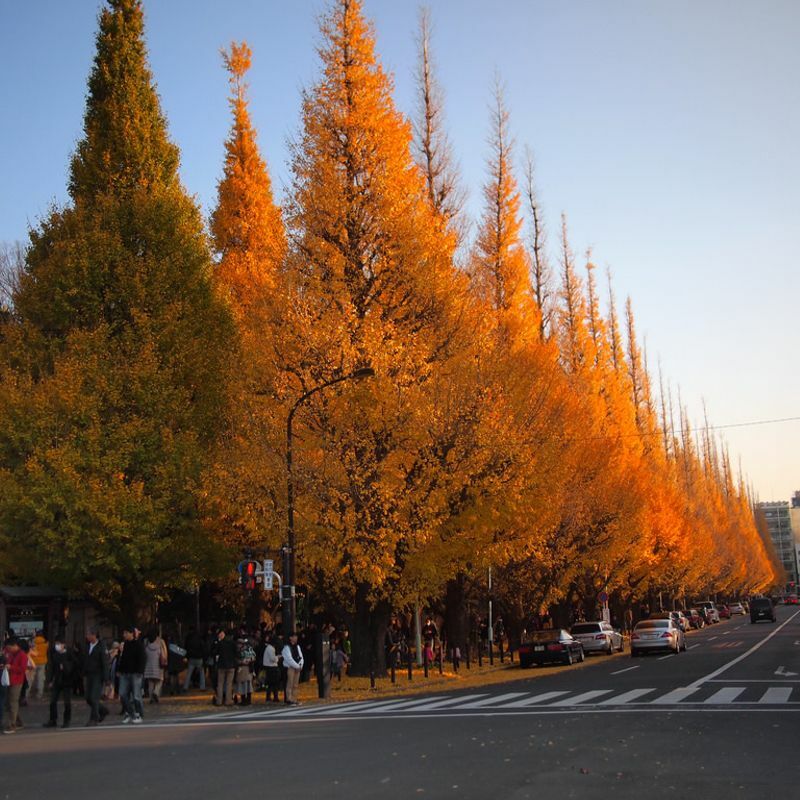 This here is the much-celebrated Gingko Avenue (Icho Namiki) in Tokyo’s Meiji Jingu Gaien Park where trees trimmed to within an inch of their lives delight autumn oglers annually around late November. The ‘avenue’ experience is largely a strolling one (in fact, Tokyo’s Icho Namiki should be celebrated equally for its pleasant sidewalks, something of a rarity in the Japan capital) and where it isn’t, it could be a driving one, as in the case of the Metasequoia Namiki in Shiga, western Japan, where a 2.4 km stretch of road on the Makino Plateau takes you through an avenue of some 500 magnificent metasequoia (dawn redwood) trees the leaves of which turn a deep red from the end of November through early December. It’s out in the unbridled wilds of Japan then that autumn leaves can be witnessed in their full glory. And it may come with the profound realization that, beyond all the hype and gimmick, and the cold, force-of-habit formality that seasonal Japan often dictates, this is something really special. Or maybe it’s just that we’ve been spending too much time in the city. Of course, for many people, the autumn-leaves-in-the-wild experience comes with challenges related to access, and, in some cases, fitness and adequate outdoor gear. Although we should use the term ‘wild’ with a pinch of salt. The vegetation itself may be free from design, but road access, bus services, and boat rides are often part of the package here. 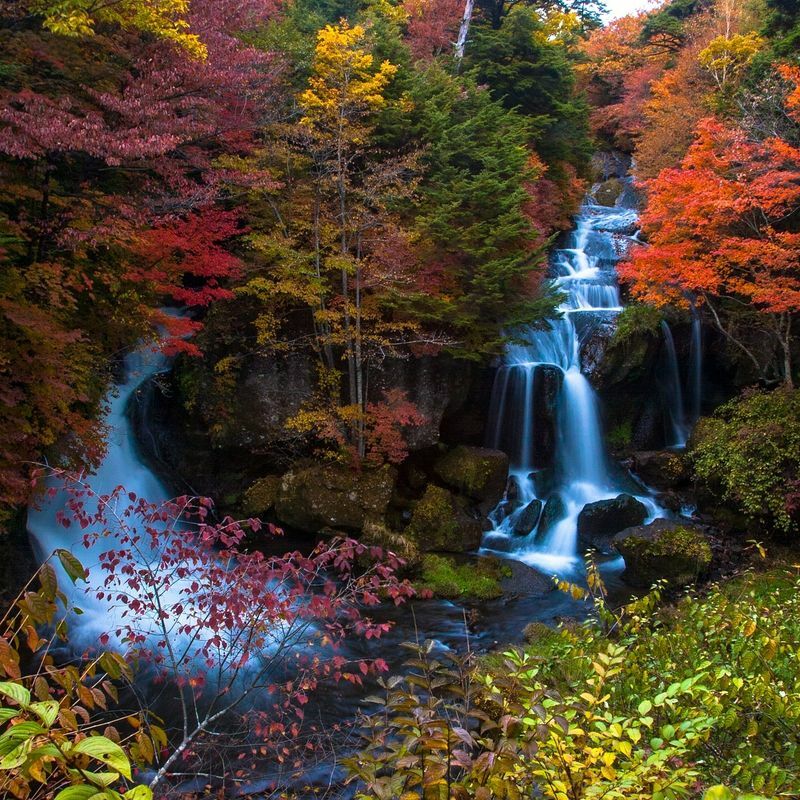 Lake Towada, a body of water formed from a volcanic caldera, straddles the border of Aomori and Akita Prefectures in northern Honshu and is a fine example of just how stunning the wild autumn leaves can appear. 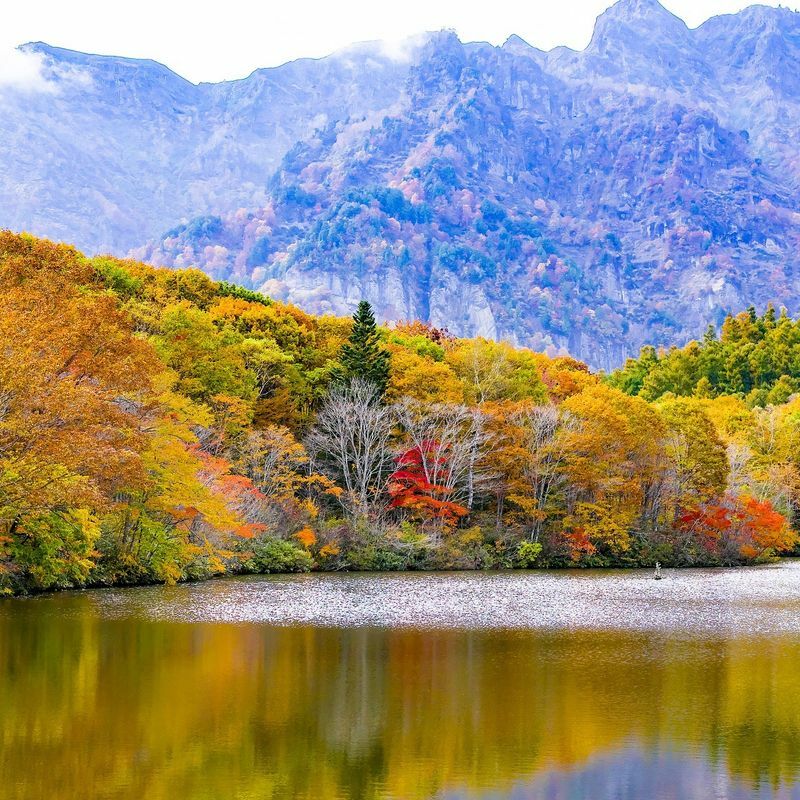 In mid-late October this is widely regarded as one of the most beautiful koyo spots in Japan. Japan’s best onsen towns and resorts are proper stunners at any time of year. Swaddled in autumn foliage though, they can rival villages in the Austrian Tyrol for picture-postcard purity. 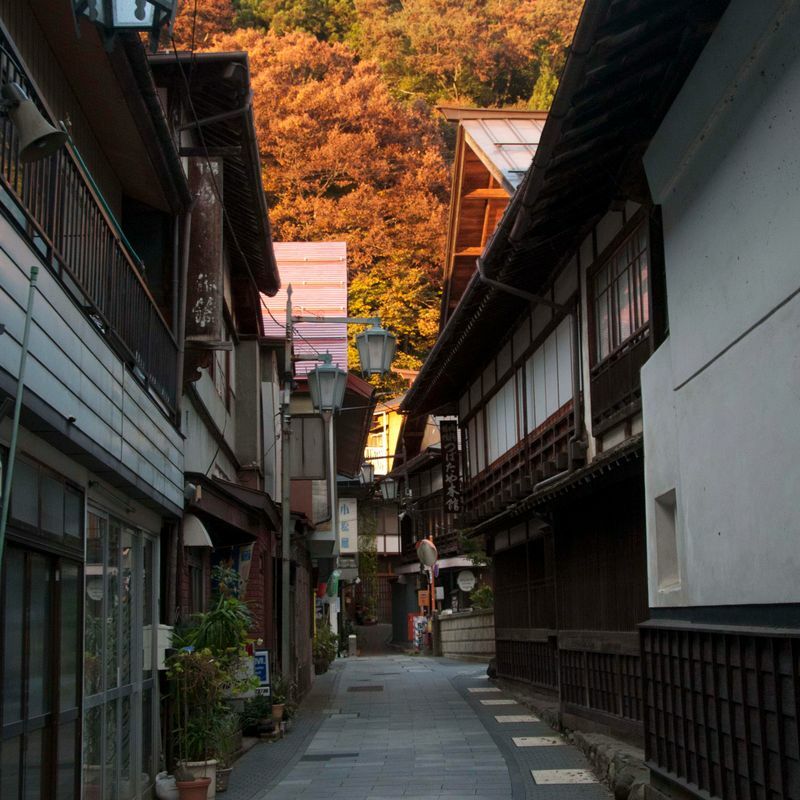 Such towns can also serve as the base from which to sample many of the koyo experiences mentioned above in one tidy package, perhaps as an overnight trip from one of Japan’s urban centers. It’s in these onsen that traditional and sometimes ancient examples of Japanese architecture and centers of worship abound, combining to delightful effect with the leaves. And where they may or may not host autumn light up events per say, these places are typically lit to haunting effect every evening throughout the year. It’s almost inevitable then, that the autumn leaves will get in on the act. Japan’s onsen typically provide access to mountains or rugged coastline into / along which hiking trails can lead visitors through the foliage. And if you haven’t had enough of an eyeful by day’s end, head to the nearest rotenburo (outdoor bath) to take a soak under a canopy of leaves. You don’t have to interact with nature to get in on the autumn-leaf experience, it seems. From early November creative company NAKED Inc. will be fusing their expertise in digital / electronic arts (they’re the ones that do the projection mapping) with the structures and surrounds of the World Heritage-listed Nijo Castle in Kyoto. Under the theme of ‘flowers and tradition,’ from Nov. 3 to Dec.12 Tokugawa Ieyasu’s old gaff will be getting a temporary makeover seeing the famous Karamon Gate, entrance to the Nanomaru, act as canvass to a display of autumnal projection mapping, while the landscaped Ninomaru Garden will be the setting for an autumn light up. A fall version of Kansai’s first World Heritage Site as you’ve never seen it before? *Know of any other koyo themed projection mapping events in Japan? Share them in the comments. Adding extra clout to the term ‘fall collection’ are these seasonal additions to the footlocker of Japanese footwear brand Onitsuka Tiger. Now, there are likely to be a number of seasonal motifs adorning the nation’s threads over the next few months, particularly when it comes to more traditional items like kimono and yukata. But, these sneakers are a stand out. 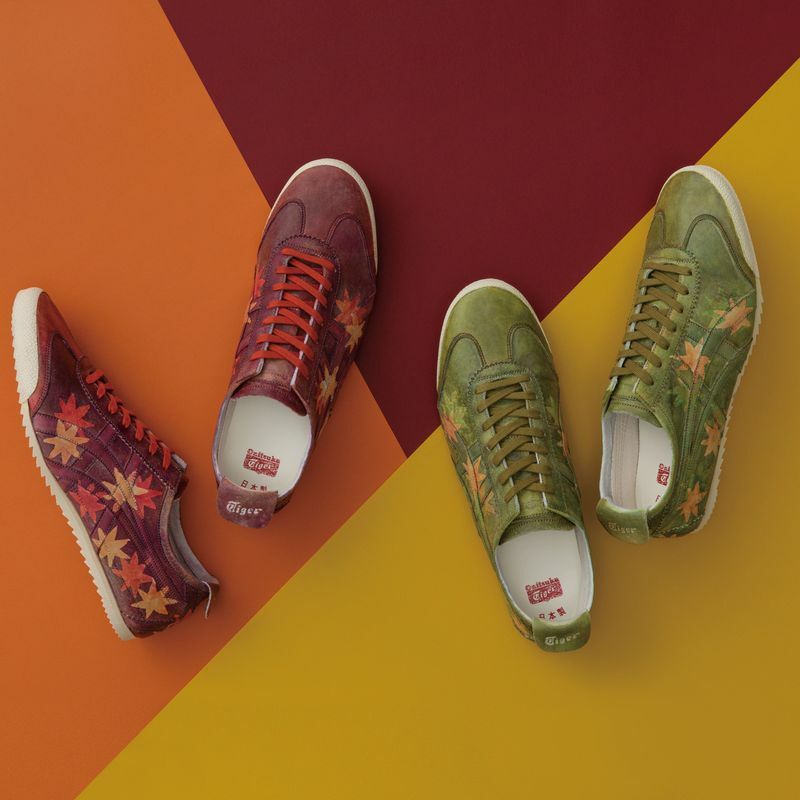 Showing off a maple leaf motif these autumnal sneakers are part of the brand’s NIPPON MADE series and are finished using traditional yuzen-zome dying techniques that originate from Tottori Prefecture, western Japan. Founder of the Onitsuka Tiger parent company ASICS, Kihachiro Onitsuka, also hails from the region. The prints are featured on the Mexico 66 Deluxe model of sneaker and went on sale on Saturday at the Onitsuka Tiger Omotesando NIPPON MADE store in Tokyo, and Onitsuka Tiger Namba, Osaka. Retailing at 29,000 yen (+ tax) though, a pair of these could perhaps get you and the partner a cozy weekend away among actual autumn foliage. The deep colors of autumn perhaps don’t lend themselves to the more marketable, ‘instabae’ creations that come out during Japan’s cherry blossom season, so aside from the odd maple-leaf-topped parfait themed eats for koyo are a little thin on the ground. 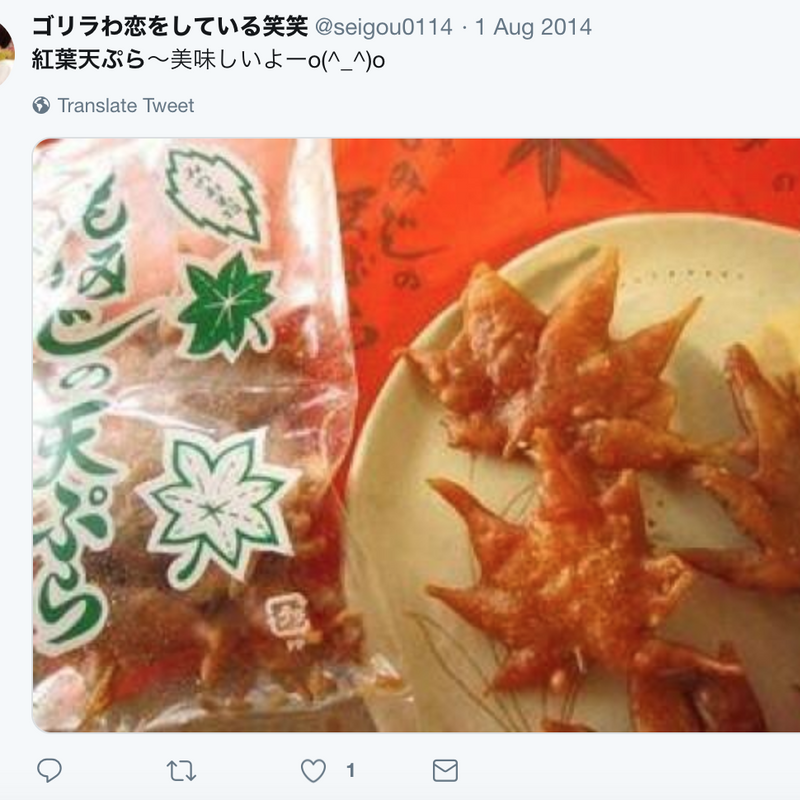 There is one item to sink the teeth into though, momiji tempura (紅葉天ぷら), for which maple leaves are salted or sugared and then fried in the traditional tempura batter. Momiji tempura is eaten as a snack predominantly in the Kansai region -- Minoh City (箕面市), north of Osaka, is something of a center for the delicacy. 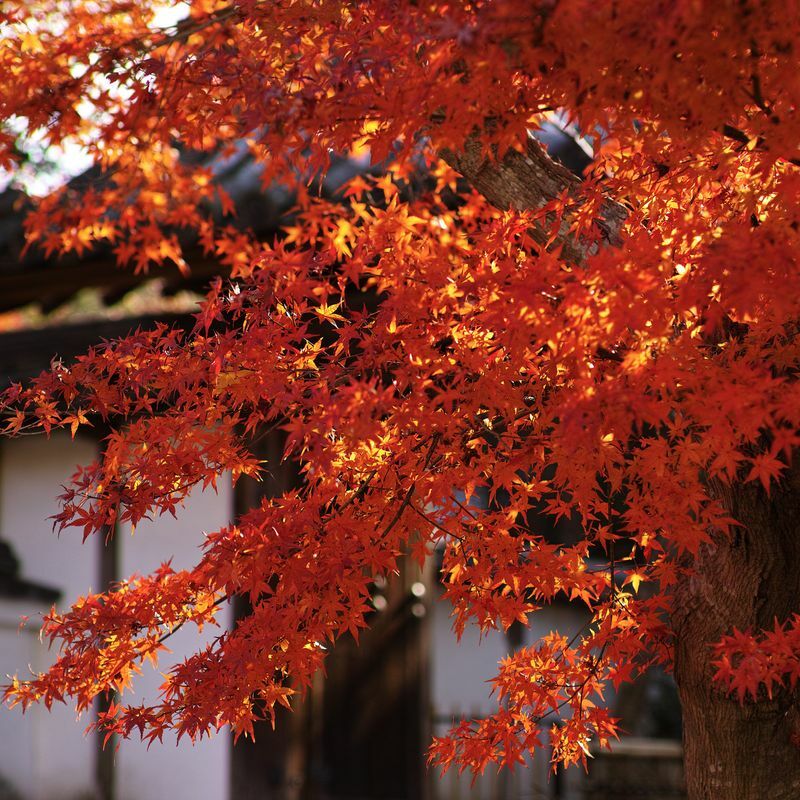 We've undoubtedly missed something in this list of ways to enjoy the autumn leaves in Japan, so if you've a koyo experience that you feel shouldn't be missed feel free to give it a mention in the comments, or tell us how you'll be taking in the autumn leaves this year. Yomomiji? Yokoyo? Doesn't sound quite right I guess.